It’s a couple of years now since we enjoyed military drill with Valerie. Sounds intimidating? Not one bit! There are few activities that are so enjoyable yet lead to such an improvement in our riding and our horse’s way of going than formation riding. Come along and find out what it’s all about. 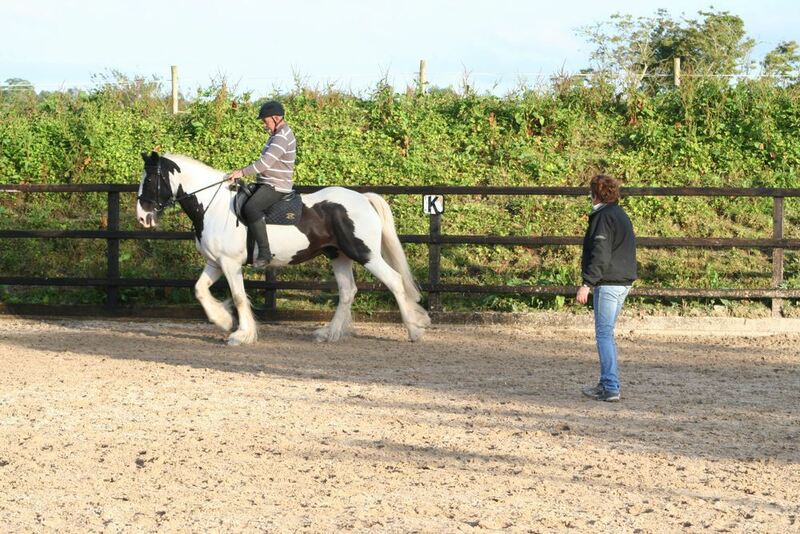 No reports have yet trickled through about our recent Friday evening lessons at Hazel’s arena with Patricia Warren. Surely this information vacuum will soon be filled by one of the club detectives? In the meantime we can look forward to a lesson with Kelda this coming Friday night at Marina and Enda’s home in St Johnston. Contact Marina to book, if you plan to go along. The past two Friday evenings were spent doing polework exercises with Patricia Warren. Al, Fenway, Lady, Bonzo and Paddy’s youngster benefitted greatly from their co-ordination and muscle-building endeavours while their riders learned about rhythm and picked up a few new tricks like the rising canter. This Friday the schoolwork takes place at Gallagher’s arena in Ballybofey, now with a greatly improved riding surface and upgraded facilities. Kelda will tutor the group as the poles are raised to jump height. Book with Anne as soon as possible on 087 610 6796, if you plan to go along. Our build-up to the forthcoming autumn league begins gradually with an opportunity this Friday evening to develop our polework under the tutelage of Patricia Warren. The lessons will take place at Cyril’s and you should contact Tanya on 086 100 2972, if you plan to join in. Damien has organised two jumping lessons with professional show jumper Tracey Gallagher at her arena in Termon, taking place on Fridays 15 and 22 August. It’s a great opportunity to get tuition from a rider who’s out there on the competitive circuit on a regular basis. Contact Damien by Wednesday on 087 763 1911, if you plan to go along. Hazel is kindly organising a series of flatwork lessons with Mary Finneran at Glenleary, kicking off this Friday evening and continuing for three weeks. It’s a great opportunity to tweak riding techniques and sharpen up for the coming series of dressage competitions. Contact Hazel on 087 746 6431 if you’d like to participate. Pictured below: Denis working hard at a lesson at Glenleary in 2012. This year’s regional training day has been organised with accustomed proficiency by the McCrossan sisters and takes place at Dirraw Farm near Ballymoney on Sunday 27 July. It offers an unbeatable line-up of instructors with Charles Maudlin, Gary Marshall and Mandy King booked for the day. Participants may take two lessons in total in one or two of the three normal disciplines — dressage, show jumping and cross country. The cost for the day will be €30 and full details will follow in due course. Staggering to think that our next Friday evening event will be in May. Where does the time go? This time it’s a trip to Termon for a jumping lesson with Tracy Gallagher at her own arena. Last year’s experience with Tracy was very positive so make the most of this opportunity to train with somebody ploughs her furrow in the professional jumping world. Every instructor finds a different little detail in each of us and it’s always getting somebody else’s view on riding skills and your horse’s way of going. Book with Damien on 087 763 1911.